My husband hunted down the only place left — in Astoria, Queens — that still made the exact stainless steel edging on 50s and 60s countertops. Our countertop installers installed this very easily and successfully on our new laminate countertops. Same PROFILE as the countertop edge, but in 1″. Re the cove: This is the one I used, but there are other designs that also look like they would do the trick just fine. 4. Note, my experience was that there was a gulp! core shipping charge – because the edging comes in 12′ strips, it must go freight. Well worth it, in the long run (no pun intended)! Here are close ups of how this stuff comes together. Hi Pam – I need help figuring out how to install stainless counters over St Charles and GE metal cabinets. Do you have any posts on how to prep the cabinets once you’ve lined them all up where they are supposed to be? 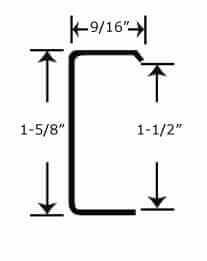 Do you need to install a plywood top or pieces of wood to connect them to each other. We’ve assembled most of the metal cabinets for our kitchen. They all seem to fit – but then my husband saw them and said how on earth do you attach them to each other and attach a counter to them? We’re going with a fairly heavy stainless counter — will the st. Charles cabinets be strong enough to hold them? Our GE cabinets will clearly be strong enough. If you have any install advice on countertops that would be great! Thanks for all your advice! My contractor did the work for me. I wish I could find a contractor like that in LA! Thank you!